I've been vaping this for a solid week now and haven't found myself getting olifactory fatigue or becoming bored of the flavour at all. 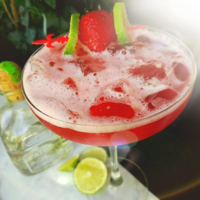 I'd describe it as a virgin strawberry Margarita that's been sitting in the sun (just because the lack of coolant). It's sweet, fruity, and unique. The first solid ADV I've ever had. Testing was done on multiple coils, including Vaporesso CCell ceramic coils (0.5ohm 25w) and ni80 4 core fused claptons (0.18ohm 90w) Steeped: 0 days, true SnV Sweet syrupy strawberry upfront, complimented by a sweet lime on the exhale. After vaping nothing but this for over a week, I've noticed a ton of "off-flavours" that actually go very well with the 3-strawberry blend. Some of these flavours include spearmint, chocolate, and pineapple. These flavours may or may not be present, I believe it's just my mind playing tricks on me. Flavour Notes TFA strawberry, TPA strawberry (ripe), CAP sweet strawberry - these three strawberry flavours together create a realistic tasting strawberry syrup. They perfectly compliment eachother. I imagine they would work as a base for other fruits. FW Blood Orange & FA Lime Cold Pressed - These two flavourings compliment eachother to create a lime flavour, with the rind. The bitterness of BO at 1.5% tastes like a generic citrus rind, and with the added lime it turns into a delicious lime. I chose not to add any Ethyl Maltol as suggested in the original recipe as the three strawberry flavours contain EM already and there were comments about the strawberry tasting muted. Instead, I used Rick's Sugar Daddy sweetener. It's the best sweetner I've used. I go with 1g of sweetner per 30ml when I'm mixing by weight. Other Notes This juice is very enjoyable. For me, being able to vape something for this long is pretty unbelievable. I normally switch flavours at least once a day. Lately I've been finding myself mixing up another big bottle before I even run out. awesome recipe!!! just like the real thing!!!! Two days steep - spot on to one of those cheap "just add tequila" strawberry margarita mixes.. which is actually super cool. Sweet and refreshing with just enough citrus. Highly recommend vaping with shots of tequila! Very tasty refreshing Margarita, surprising how the strawberry isn't too strong as i was a little concerned about that much strawberry but with the EM, lime and blood orange it all blends together nicely. I added 5 drops of koolada in 30ml just to make it more of a frozen margarita. Well worth a mix. Delicious recipe. I made a second batch and dropped the cold pressed down to 1.5% and added 1% koolada and for me it pushed this recipe into my adv rotation. I also might try messing around with JF sweet strawberry since i have trouble tasting most strawberry vapes. Well done indeed. Ever thought of putting TPA Champagne in? This was really nice, well done!